On Jan. 8th, our friend Katie Zoller from Iowa State flew into Bolivia as part of her round-the-world travels and so we took a week off and explored southwestern Bolivia with her. First we all flew to Sucre, spent a night there and then got a bus to Potosi. Despite all the time Tom and I had spent in Sucre (language school, with Tom’s parents), we had never ventured to the other cities to the south so we devoted this trip to the region called Potosi, the capital of which is the city of Potosi. From Sucre, Potosi is a three-hour up-down, up-down bus drive which eventually took us from 10,000 ft to 13,300 feet. The city of Potosi is one of the highest in the world and is home to an enormous silver mine, which the Spanish colonists greatly exploited, using the locals as slaves, and the Spanish colonial mint where coins for the whole Spanish empire (and after independence, Bolivia) were made. (Ironically, since 1951 the mint has been closed and now Bolivia imports their currency from Canada, France and Chile). Potosi was cold and rainy and our hostel only turned their heat on for a few hours at night, but even still we enjoyed the two days we spent there. 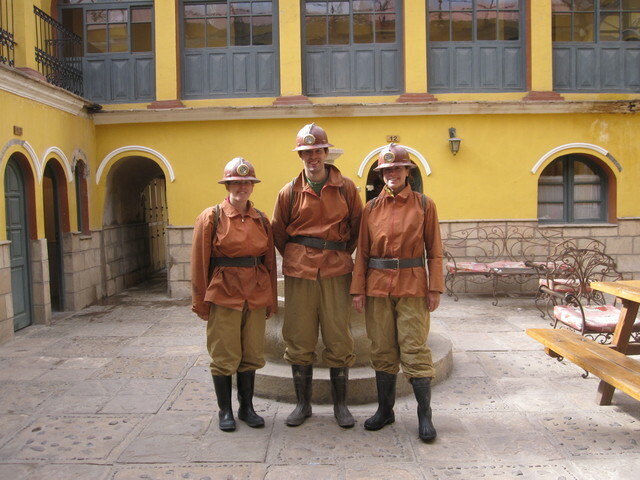 At our hostel, suited up and ready to go on the mine tour. Our hostel “La Casona Hostel” was an old colonial house built in 1792. We learned how to detonate dynamite and that it won’t explode if you just light it on fire (as the guy explaining this takes his lighter and lights the stick of dynamite on fire right in front of us). Once the dynamite blows, they use these carts to get the rocks out of the mine. Three men push/pull one cart that weighs over a ton! 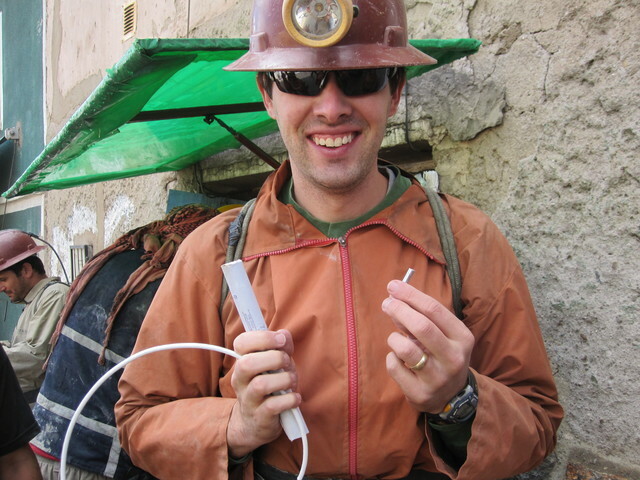 They currently pull out silver, tin, lead and zinc from the mountain but arsenic is literally oozing out of all the walls. Katie and I inside the mine with a group of miners, we had gone ‘down’ several levels so it was quite warm here. 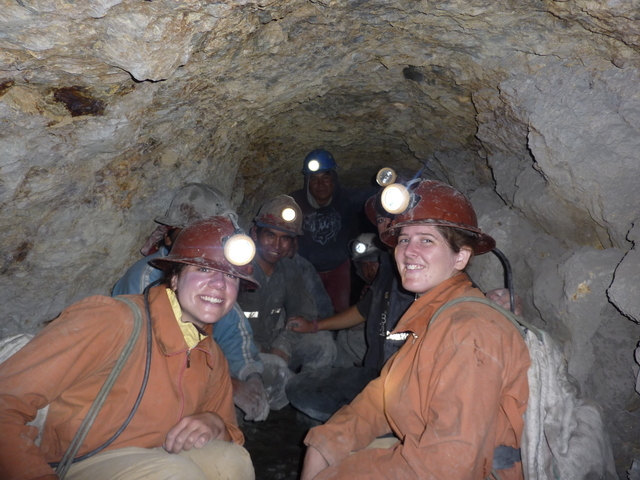 All the miners wanted kisses from us on the way out (they work 12-24 hour shifts…all men…you can imagine). I should note that despite the fact that they let tourists in, the mines are still working mines complete with daily dynamiting. Luckily the day we were there was a no-dynamite day because they were doing safety-checks on the supports in all the tunnels. The mine used to be nationalized but the state decided it wasn’t profitable anymore and so now independent co-ops each own a different mine-entrance. There are two problems with this: 1. when a miner is injured or dies there is no organization or insurance that pays out, the family’s just SOL; and 2. The groups are fiercely competitive and so don’t talk to each other about their movements inside the mountain. Meaning, you could have someone dynamiting the wall right next to you, and you’d have no idea. UNESCO wants to shut down the mines and turn the mountain into an historical site. However that would turn 20,000 people out of work and so they are vehemently opposed to this and HATE UNESCO for suggesting it. 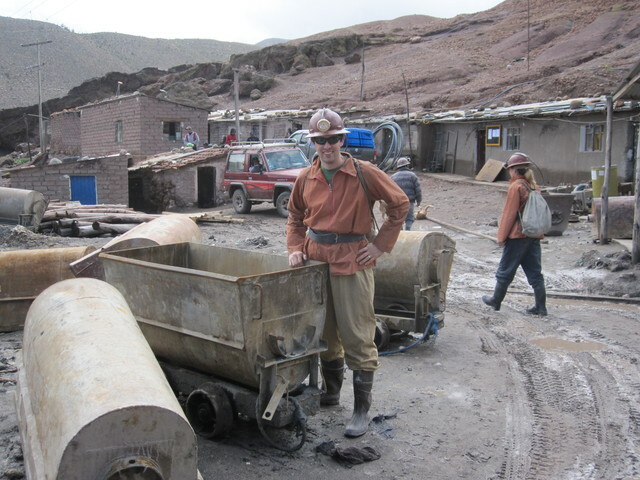 Mining has been in families for generations and it seems like if there wasn’t mining in Potosi, people would feel like they’d lost their identity.